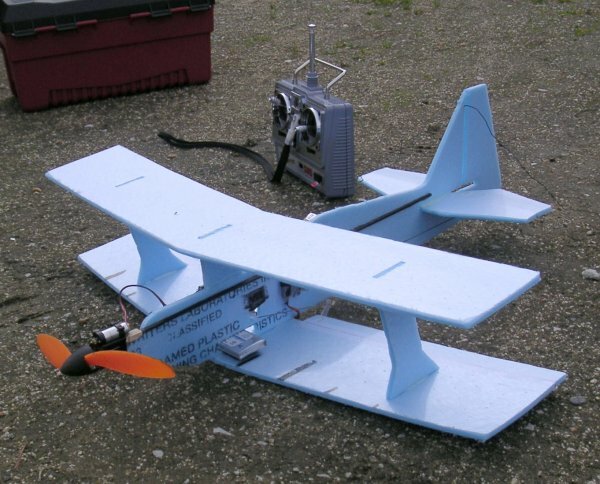 My new homebuilt biplane, cut from "blucore" blue foam. It's a 23" "Ultimate Bipe", made from plans downloaded from Foamy Factory. It's pretty cool -- you download a PDF, print it as multiple pages, then tape the pages together to get a blueprint for a plane. Someone told me that if you print it on a laser printer you can iron it right onto the foam, but that didn't work for me (I ironed forever and only got a tiny bit of ink transferred) so I just pinned the plans on top of the foam and cut through both foam and plans with an x-acto knife. Then epoxy the pieces together, epoxy a piece of carbon fiber tubing down the fuselage so it doesn't fishtail back and forth (the plans say to reinforce the wings too, but they seem pretty stiff just from the struts) with a stick on the front to mount a GWS IPS motor, add servos (they're taped in place; I've seen some people glue them -- do they buy new servos for each plane?) and the other radio gear, and you have a plane! 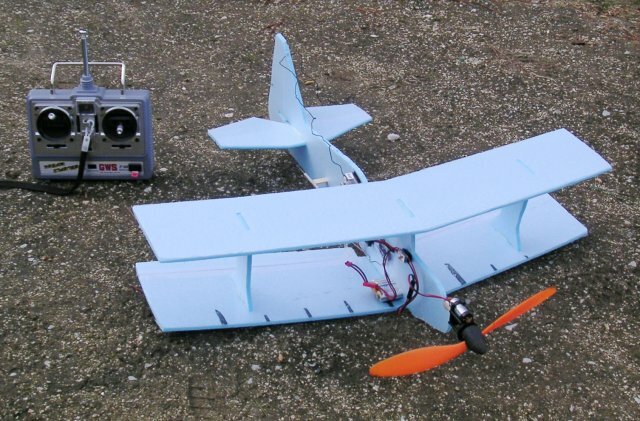 It actually flies, amazingly enough! (I don't have pictures to prove it -- Dave was too busy flying his own planes.) Though the first few times it smacked into the ground when I threw it -- turns out it had a little down-trim, which I needed to take out. I'm throwing it because all the sites where I fly have grass, and wheels don't work very well except for teeny planes with huge wheels like the Pico Stick (and even then, they fall over on landing half the time). It doesn't fly very well, though. Despite its 23" wingspan and 6oz weight with an 830mAh LiPo battery, the IPS motor (borrowed from my Pico Stick) is just barely enough to keep it in the air, and it can't really struggle higher than 10-20' off the ground. Perhaps giving it a real airfoil would help, or at least smoothing down the leading edges of the wings and other surfaces. I have a dual IPS motor, which I can bolt on if need be, but I'm hoping this will be a slow flier for very small spaces and indoor use, so lots of power isn't really needed (until I get to the point where I can fly 3-d maneuvers, anyway).